Leadership Mini Workshops - SkillWorks Ltd.
Short on time but still need to increase your capabilities in some core areas, then our 4 Hour Leadership Mini Workshops are ideal for you. Our Leadership mini workshops are immersive, highly interactive & practical workshops which are guaranteed to increase your skill set quickly and effectively. Facilitating meetings effectively is essential to any Product Managers, Project Manager and Leaders skill set. Where else could I use the skills I learn on a Facilitating Effective Meetings/Conference Calls for Leaders course? 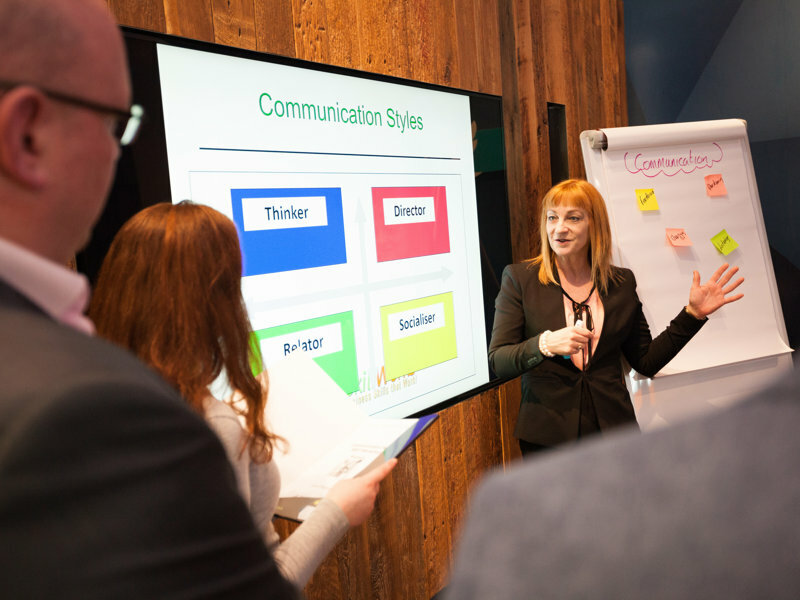 The skills you will learn on the Facilitating Effective Meetings/Conference Calls for Leaders course can also be used when running a workshop, a training session or when presenting a presentation to a group. I find it difficult to deal with challenging people when facilitating a meeting. How will this course address this? We work on a specific module ‘Diplomatically manage challenging behaviours’ which covers how to deal with challenging people and their behaviours in an assertive way. We also incorporate some challenging behaviours into some of the mock meetings so you get first-hand, guided experience of managing the behaviours. All SkillWorks courses are highly interactive and highly participative. Modules are run in a workshop format with opportunities to question, discuss, record and practise new skills. Laura was very engaging and easy to listen too. Very good at providing examples and for each topic. Thoroughly enjoyed it. Instructor knows her stuff, is real life and down to earth. Would love to go on another one of Laura’s courses. Laura made the training very special. One of the best courses I’ve been on. Coaching is one of the core skills identified by the Chartered Institute of Personnel & Development (CIPD) for Leaders. Learning to coach will empower and instil confidence in your team members. I’ve been leading people for awhile. How will coaching benefit them? Coaching is one of the core Leadership skills identified by The Chartered Institute of Personnel & Development (CIPD). On this course, you will learn how to help people increase their self-awareness and become pro-active in providing their own solutions to work-related issues. What other skills will I gain from this course? You will increase your listening skills and questioning skills which will add to your repertoire as an effective communicator and therefore will enhance your communication skills at meetings, on conference calls, in negotiations as well as assist you when giving feedback. Laura was very good and informative. The course material and hand-out was very good and clear. Good that it had more hands-on / practical exercises rather than just listening / looking at slides. Great course, to the point, relevant. Good mix of in info and exercises. Good pace. Being able to give feedback is an essential skill of any Leader / Manager. This course is for Leaders / Managers who would like a clear structure to follow in order to get the best from the person receiving the feedback. I find it difficult to give someone feedback on their negative behaviour. Will this course address this? Yes, this course will provide you with a clear structure to implement when giving feedback either on behaviour as well as general performance. I find it difficult to come up with examples of behaviour or / and performance when giving feedback. Will I learn how to do this on this course? You will learn the importance of collating examples prior to the feedback meeting on the course. You will also learn the importance of setting out clear goals and objectives on a regular basis so you can explain where the person is not achieving their goals / objectives in a clear way. Laura, you are very clear and easy to listen to. You sell your messages effectively and with conviction. Excellent session, plenty of opportunity to practise and get feedback on my own abilities / performance. Excellent session ‘effective feedback’. I feel confident to carry out my observations and to address issues with the team. Thank you. Really enjoyed the course. Relevant, interesting, memorable examples. Really good course. Laura is great. Practical was very useful and interesting. Thanks for the great course Laura. This course is suitable for Leaders / Managers who want to move from the old autocratic style of Leadership and to Collaborative Leadership to get the best from their people. This a mind-set and behavioural change course therefore, you will learn how to use and tweak your existing skills to be a more effective and collaborative leader. Will I be able to use what I learn immediately? Yes, you will learn how to adjust your way of thinking and your approach to leading people straight away. The practical (Collaborative Leadership) exercise showed how Collaborative Leadership really does work over direct leadership. Very insightful course. Practical piece was enjoyable. Thanks for another great training course Laura. Everyone can communicate but not everyone can communicate effectively. This course is ideal for Leaders or Managers who want to ensure they achieve what they set out to achieve when communicating. The course also covers how to ensure there is clarity in your message so it’s not open to interpretation. How will this course make be a more effective communicator? This course will make you a more effective communicator by showing you how to identify what you want to achieve as a result of communicating and how to phrase sentences clearly and concisely for maximum impact. Yes, all of the learning from this course can be implemented immediately. Excellent, thank you. This will be hugely beneficial in my position. The course was very informative and well explained. I’ve come away with a better understanding on how to effectively communicate. Course was good and helpful. Have attended similar courses before, but found this course easier to relate to. Laura was a fantastic trainer and provided excellent insight and guidance throughout the course.